This post is long due! I found it in my drafts! I think I went to Hong Kong almost 7 months ago... Anyhow, I thought I would post this as it would preserve my memories online. 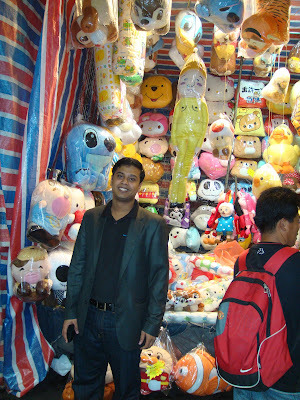 I was with my colleague and friend for this trip to Hong Kong. The primary reason for our trip was to attend the Learning World Conference at HK arranged by Uni Strategic and we being a Media Partner (www.ms-asia.org). As we were leaving from Manila (Cebu Pacific, Ninoy Aquino airport), this girl at the Cebu Pacific ticket counter asks us if we would be ok to travel by the next flight instead of this one. We obviously said NO! But then she said that if were were ok to get onto the next flight, Cebu Pacific would give each of us a free round trip to any of their locations - domestic and international. They would also put us up in a hotel room while we wait! I thought of it for a while and then said ok as I felt it was a good deal and that we had time to kill since the conference was only the next day. Then the Cebu folks made us wait by the counter for a good 15 minutes before coming back and telling us that they were sorry but someone else hadn't turned up and hence we would have to get into this flight!! I was like, "What the hell?" Are we like goats to be herded in if they felt like it or to be left out if they were full! But then, there was nothing we could do. I felt so embarrassed walking down to the flight with the lady at the counter. Low-cost airlines should remember that they may be low cost but nowhere in their name does it say - "Low Service" or "NO Service"! Customers will wake up soon! Maybe I should start an insurance firm insuring passengers going by Low Cost airlines. This service could give passengers lounge access in case of flight delays or food packages to take into the flight and what not! The possibilities are endless. And with more and more low cost airlines coming up, I'm sure I'd be a millionaire pretty soon - WOW... I should actually do this! Airlines could insure their setup with me! So could passengers... Pretty neat idea huh?? Well anyway we were on board to get to Hong Kong - a city which in my mind meant Cosmopolitan or Asia's Manhattan! The flight was pretty short (2 hours) and we got to HK. I've already been to the HK airport many times but the size did amaze me again! The hotel that we were booked into had a shuttle service arranged for us. The journey in the bus to our hotel was just the beginning of our awe and astonishment while we looked at the huge skyscrapers! They just seemed to go on and on and on! The roads were beautiful and so were the bridges, the tunnels, the ferry boats, the ships, the shipyard! We saw so much of HK just travelling in that bus! Well for travellers going to Hong Kong, the sheer size and height of this city will just amaze. But apart from that, I really didn't find anything that kept me gripped. The trip the "The Peak" by a winch was nice as it takes you up a hill and gives you a beautiful view of the city. It was so chilly there and my friend and I were the only ones there without a sweater. The nightlife can be found on Lan Kwai Fong and Wanchai. We couldn't go to Macau as we didn't realize that we needed our passports and had left them in the hotel. Well not all of Hong Kong is skyscrapers and boutique stores. A lot of the streets remind you of India (Well the British were here much after they left India too). But everything is organized here with proper places to cross the roads with attention given to pedestrians. 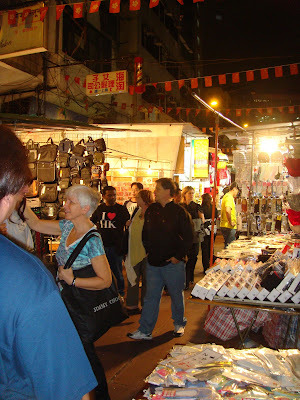 Another place that one should not miss is the Night markets of Hong Kong. This is where you can buy souvenirs at bargain prices. Chinese electronic goods, t-shirts, and many other souvenirs....Remember to strike a bargain here, always quote half the price of what they ask for and you may land up getting a decent deal.